Learn How Fresh Mouth Can Support Your Oral Health! Fresh Mouth is the secret to perfect oral health! This super concentrated, fluoride-free formula uses the power of the very best organic and wildcrafted herbs to cleanse your mouth, freshen your breath, and encourage healthy teeth and gums by fighting the organisms that negatively affect your teeth, gums, and cause bad breath. Try Fresh Mouth Today and see why it’s the choice of many for natural oral care. Dr. Group formulated Fresh Mouth as the ultimate solution for natural, fluoride free oral care! 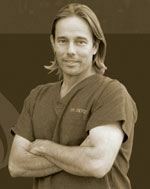 Fresh Mouth is created using Global Healing Center's proprietary Spagyrex® processing technique which Dr. Group created in response to studying the works of the famous 16th century healer, scientist and alchemist, Paracelsus. Paracelsus, composed the word Spagyria (Spagyry), which means to extract (spao) and combine (ageiro), to describe the process and power of transmuting a preparation of herbs into an elixir of health and longevity. Dr. Group took this original technology and advanced the science and art of spagyry-based processes into the Spagyrex process, which combines ancient and current technologies into a revolutionary, multi-step, proprietary alchemy and spagyry-based processing technique. This follows the principle of separating and recombining all the elements of an herb, to extract the most powerful essence of its healing nature, resulting in a Harmonious Organic Supercharged Extract. Fresh Mouth is a potent dental hygiene formula that nourishes gum tissue and provides a blast of natural antioxidants. This combination fights the organisms that cause unhealthy gums, making Fresh Mouth an integral component of complete dental wellness. If your gums are red, swollen, tender, have pulled away, or bleed when you brush, you owe it to yourself to try Fresh Mouth! In addition to fighting the harmful organisms that harm tooth enamel and gum health, Fresh Mouth fights bad breath! The potent liquid formula reaches deep between the teeth and gums to thoroughly clean your mouth, leaving it fresh and bright. Research has proven that when harmful organisms take over your oral cavity, it can lead to serious health problems elsewhere in your body. When you use Fresh Mouth, you can kill these harmful organisms before they spread, taking the burden off your immune system and encouraging good health throughout your entire body. It’s not always convenient to brush your teeth and few people carry a jug of mouthwash in their pocket. Fresh Mouth comes in a perfect, one fluid ounce size that's easy to take anywhere and great for travel! Fresh Mouth is formulated with herbs that are certified organic or naturally wildcrafted and grown without the use of harsh chemicals. They’re hand-harvested at peak potency before being promptly extracted while still fresh, succulent, and full of life. Fresh Mouth is completely safe, natural, and backed by a 180-day money back guarantee! Plaque can form and begin damaging teeth just 12 hours after eating. After age 35, 4 out of 5 adults are prone to gum disease. Periodontal disease strikes 80% of adults over 35. Bad breath, or halitosis, may be caused by bacteria, tooth decay, or gum disease. Smoking, drinking coffee or alcohol, and taking certain medications can contribute to bad breath. Americans spend over two billion dollars every year on breath freshening products. Chronic bad breath affects as many as 40 million Americans. As people age or take medications, they're more likely to experience dry mouth, which can worsen bad breath. An imbalanced diet is directly linked to negative oral health. What are the Benefits of Fresh Mouth? Provides natural, cleansing protection in a fast acting spray. Fights harmful organisms and helps create an environment that’s favorable for good oral health. Stimulates and encourages normal gum health. Soothes swollen and irritated gums. Encourages normal pH levels to protect tooth enamel. The herbal blast of peppermint, eucalyptus, and spearmint revitalize your mouth and keep your breath fresh all day long! Trusted, used, and recommended by dental professionals. We are sure you will see and feel the breath freshening results of Fresh Mouth. Why is Fresh Mouth the Best Oral Health Formula? Doctor-developed, super concentrated formula supports superior dental health! 100% pure, natural, and organic -- no additives, preservatives, or artificial ingredients. Great tasting herbal blend freshens the mouth and naturally corrects bad breath. Works great with dental appliances. Promotes gum resiliency and longevity -- great for daily use! Liquid formula infiltrates the pockets between gums and teeth. Compact size allows for easy travel. Packaged in natural amber glass to prevent light damage. Proudly made in the USA from globally sourced ingredients at Global Healing Center’s facility. What are the Top 3 Questions People Ask About Fresh Mouth? 1. Why is oral health important? Your mouth is full of helpful antibodies called "immunoglobulins" that protect you from at least 300 different types of harmful organisms that target your oral cavity. As you age, your body produces fewer immunoglobulins. Unchecked, oral bacteria can enter the bloodstream where they can directly affect the rest of your body. 2. How does an unhealthy mouth affect overall health? An unhealthy mouth can quickly become a chronic problem by allowing cytokines, which are chemical messengers, to circulate throughout your body, causing systemic redness and swelling, as well as disease. 3. How do I know when my gums are healthy and why is it important? When your gums are healthy, they’re firmly attached to your teeth. If your gums have a healthy attachment, they’ll appear pink, firm, and never bleed or hurt when brushing or flossing. Healthy gums greatly stack the cards in your favor for avoiding serious oral health problems. Brush at least twice a day, floss at least once a day, and clean your tongue! Gargle with an organic mouth rinse or hydrogen peroxide. Start oil pulling with O2-Zap®. Be aware of medications that cause dry mouth and bad breath. Take a probiotic, a number of probiotic strains help support oral health. Avoid sugar, it significantly increases plaque accumulation. Chew fresh mint leaves for a quick breath boost. Discover Incredible Oral Health Today With Fresh Mouth! Known for its sharp odor, refreshing flavor, and cooling sensation, peppermint is an ingredient in many oral health products because it directly fights the harmful organisms that negatively affect the gums and oral environment. Spearmint is an amazing source of antioxidants and also helps kill the organisms that affect oral health. Additionally, the refreshing, cleansing flavor helps remedy bad breath. Eucalyptus is toxic to many of the harmful organisms that can reside in the mouth and negatively affect the gums. Similar to tea tree and eucalyptus oil, pine is a potent agent that is toxic to many harmful organisms. Organic clove has long been a remedy that encourages healthy teeth and gums. Myrrh offers dual support; it reduces swelling and soothes sore gums and is also toxic to organisms that cause bad breath. Sage contains essential oils that are toxic to the harmful organisms that create an unhealthy, acidic mouth environment. 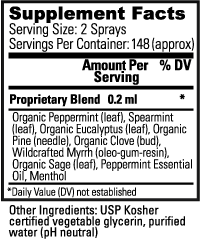 Peppermint oil and its components: camphor, menthol, and carvacrol encourage oral health and fresh breath by helping to eliminate harmful organisms. Found in breath freshening products like mouthwash and toothpaste, menthol is the active ingredient in peppermint that provides the cooling sensation and minty essence. Shake bottle well. Spray 2-3 times in mouth as needed. What other factors affect tooth and gum health? How do antioxidants affect oral health? What other antioxidants encourage oral health? Other situations that bring about gum disease and tooth loss include smoking or chewing tobacco, stress, poor oral hygiene, heredity, and chronic illness such as diabetes. Antioxidants help neutralize the free radicals that cause oxidative damage. In 2005, researchers at Texas A&M University Baylor College of Dentistry determined that antioxidants were able to minimize the harmful effects of free radicals. Vitamins A, D, and E all support oral health. Vitamin C is important if you have bleeding gums. It helps with collagen building, which is a component of tissue. Ubiquinol or Coenzyme Q10 is another powerful antioxidant that, in preliminary studies, supports healthy gums. Your teeth and gums are part of your body and they need the same nutrients the rest of your body needs. When your nutritional requirements are met, you’re best positioned to enjoy not just a vibrant immune system and a state of optimal health, but firm, pink gums, and strong bone around your teeth.